The best backyard chicken coop will ensure safety and comfort for your chickens for the best productivity. Chicken coops are slowly becoming common as more people appreciate the benefits of poultry. Building one for yourself might be time consuming and hectic, buying one that comes with the best features such as great ventilation, roost perches and nest boxes the better option. Both you and your family will love the homegrown and homemade eggs for your breakfast, the fluffy chicks running around your yard, a pest free home and the manure to use on your flower beds. Before ordering any chicken coop, you should first answer these questions: Is the coop for 2 or for 10 chicken? How many nest boxes does it come with? What’s my budget? Now let’s have a look at some of the best chicken coops that you should consider buying for a great experience. The PawHut Wooden chicken coop is nicely designed to give you a backyard run and a nesting box. The nesting box has two partitions and easily opens to allow easy collection of eggs. With the backyard run, your chickens get the freedom to run around the pen and exercise. The prefab chicken coop comes with a roosting pole which will give your chickens more rooms to sleep and flexibility in their sleeping. Air circulation in the coop is great thanks to the wire mesh around the backyard run. Other than allowing for free air circulation in the pen, the wire mesh also ensures the coop to be well secured so you won’t have to worry about predators. In addition, the coop comes with a ramp and a sliding door making it easy for your chickens to enter in and out of the sleeping room. Its bottom floor pan slides out easily for cleaning. Its roof is water resistant, so you won’t have to worry about your chicken getting wet whenever it rains. You will love that you can easily move the coop to your desired area when you wish to because it’s very portable. PawHut Wooden chicken coop gives you a secure, portable and easy to clean chicken pen. It is built to allow light into the coop with an attached run making it the best small chicken coop. SnapLock Formex Large Chicken Coop is the best plastic coop. It is large with 4 nesting boxes and 3 roosting poles. The dividers on the nesting boxes are removable to enable you to increase their sizes when you need to. You will love that it is lightweight, weighing about 40 pounds, which makes it easy for you to move to the desired location. It is also sturdy and well designed to withstand most weather conditions. When it comes to setting up, the coop is easily and quickly put up. If you live in a cold region, you will love the convenience of the double-wall with thick plastic that keeps the coop warm. The hutch has large ventilations at the top that are adjustable and strategically placed to allow free flow of air within coop without letting water in. SnapLock Formex coop is easy to clean thanks to the plastic material which does not absorb waste materials and the litter tray that easily pulls out for cleaning. When it comes to your chickens’ safety, the lockable entrance and strong material will keep the coop safe from predators. You can access the nest boxes easily to collect eggs via the hinged rooftops. Again, the coop comes in two sizes; a smaller one to hold up to 4 chickens and a larger that can hold up to 12 chickens. This gives you the freedom to go for what you want. SnapLock Formex has been built using plastic giving it a lot of advantages. The good size, perfect layout, sturdiness, ease of set up and multiple ventilation make this the best plastic chicken coop. 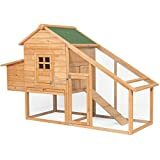 Zoovilla Country Style chicken coop mimics a barn and has a spacious design that holds up to 6 hens. The hutch comes with 4 doors giving you the convenience of accessing both the brooding area and the run area with ease. The 2 doors on each section also give your chickens the freedom to roam around your yard. No need to worry about your chickens’ protection as the doors are lockable keeping them safe from predators. It comes with two big nest boxes that give your chickens the comfort of laying eggs and brooding in a spacious place. When it comes to collecting eggs and cleaning the hutch, the nest boxes have hinged rooftops that are lockable and opens for stress-free access. Cleaning the cage has been made easy by the removable droppings pan. The droppings can be used as manure for your backyard flowerbeds. The roof panels are made from weatherproof material that will shelter your hens from hostile weather over years. The hutch has a well thought through design to hold 6 chickens. It is safe and can withstand most weather conditions making it the best large chicken coop. The Rite Mobile Coop features 6-inch wheels that make it the best mobile chicken coop. It’s quite large for one to move it alone, so the wheels come in really handy. For this reason, it’s the best portable chicken coop. Again, it features a weather resistant design. The hardboard panels used to construct this coop are resistant to rot and ultraviolet rays to prevent the plastic from breaking due to too much sun. The weather-resistant coop with rust-resistant mesh will grow with your chickens for years, protecting them from harsh weather conditions at all times. The latches on the run area and the roosting area are lockable to ensure your chickens’ safety both at night and during the day. Although the roofs do not open, the double doors leading to the coop and running area are large enough for easy access during egg collection. When it comes to cleaning, all you need to do is pull out the droppings tray, clean it and put it back with less hassle. The sides of the coop also clean easily using a hosepipe. The wooden stairs will allow your chicken to move easily from the sleeping area to the run area and back. The coop comes with 4 vent holes that are convenient for great air circulation within the coop to keep your animals from suffocating. When you want to separate the sleeping area from the run, the coop comes with a board that easily achieves this. This way, you can easily transport the coop or increase warmth in the sleeping area during winter. Rite Farm Products Lifetime Series chicken coop has been designed to last over years. The material is easy to clean making it convenient for you. The wheels on the hutch make this the best mobile chicken coop. 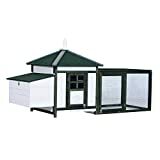 The New Age Pet Fontana chicken barn is the best small plastic chicken coop as it works best for 2 chickens. Unlike wooden coops, this plastic wood is durable and also easy to clean because unlike wood, plastic doesn’t absorb any waste. It’s also very sturdy, and the overall finishing is very attractive. 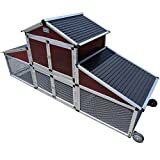 It does not come with an attached runway, but you can buy one separately and give your chicken the freedom to exercise and keep healthy. The nesting box will keep your chicken comfortable while laying eggs and brooding. You will love the convenience of the easy to clean and assemble coop. Not to forget the 10-year warranty that confirms the durability of the hutch. Since the coop does not have great ventilation, you will need to keep the door open to boost air circulation within the cage. You don’t need tools to assemble it, and the ecoFLEX material provides a healthy and durable chicken hutch for your chickens. It is the best small plastic chicken coop. Other than just chicken, this coop will house other small animals if you have any. The easy access doors on either side of the pen and a nesting box that opens and closes makes the collection of eggs and feeding the chicken easy. The windows coupled with the mesh fencing ensures free circulation of air in the hutch. When it comes to cleaning, the bottom pan is removable and is made from easy to clean material making your work easier and quicker. The attached meshed extension offers your chicken a run area and gives them the freedom to move around keeping them active and healthy. It has a ramp that slides from the sleeping area to the run area for easy movement of your chicken in and out. The cage is made of durable fir wood to shelter your chicken from harsh weather conditions for years. 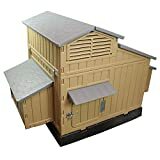 There is no reason to build your own chicken coop when you can get this wooden coop at a great price. The sturdy 75-inch pen is made to withstand most weather conditions and to be durable to offer shelter to your animals for longer. The 87” chicken coop by Pawhut is another great wooden large chicken coop. It features an easy to open roof, thus making it easy to clean while also ensuring sufficient air circulation within the pen. It has a raised sleeping area to keep your chickens away from wet grounds when it rains. The floor pan in the nesting area is convenient for you as it easily slides out for cleaning. Again, the indoor nesting area has numerous roosting poles and a huge nest box with 2 sides making this coop convenient for your chicken and their young ones. When it comes to collecting eggs, the top of the sleeping area has been hinged hence easily opens. With this coop, your chickens will have enough space to run around thanks to the large run area. The ramp leading to the indoor nesting room make it easy for your chicken to get in and off the nesting area. Although the coop can be tough to set up for the first time, with the best chicken coop kit you will easily fix it in minutes. PawHut Deluxe wooden chicken coop gives you the freedom to keep as many chickens as you will find comfortable thanks to the numerous roosting poles and the big nest boxes it comes with. Also, you can easily modify it to be larger. 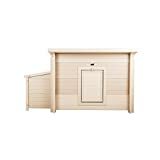 This is the 80” wooden chicken coop by Best Choice Products. It has two doors, thus making it easy to access whether for cleaning or feeding your chickens. Each of these doors has a strong locking system that guarantees safety. You can access the pen with ease from both sides. You will also love the convenience of the nest box on the side which has a cover that opens making it easy to collect eggs. The rooftop can also be easily opened when you want to clean the coop and feed your chickens. Again, the ramp allows chickens to move in and out of the raised sleeping area with ease. When it comes to safety, the coop has a raised sleeping area and a strong metal fencing to keep predators away. The fencing doubles up as ventilation for the hutch. Cleaning has been made easy by the removable droppings pan which slides out effortlessly. This coop can hold 2-4 chickens comfortably and can also be used to house other small animals. 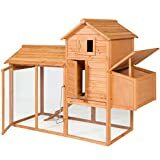 The great accessibility for cleaning and feeding the chicken through the opening roof and the two doors makes this a great coop for less than 4 chickens. This is a lightweight chicken coop, but it’s very sturdy. It’s well ventilated, and it’s also designed to provide optimal protection for your chickens. The mesh on the window and around the coop keeps predators away giving you confidence in the safety of your animals at all times. The roosting zone has two nesting areas ensuring your chickens are comfortable while brooding and laying eggs. It has a sleeping area and a chicken run with a ramp to make the movement easy. Again, the coop comes with readily drilled holes and installation guide that will make assembling easy. The walls of the brooding areas are designed to keep the animals inside warm throughout. Collection of eggs and cleaning is easy thanks to the hinged rooftop and the huge door of the brooding areas that opens easily. The two small doors make it easy for you to attend to your chicken. The chicken coop is cozy and spacious. It is easy to set up and offers the sleeping area, nesting area and the run separately making it best choice if you have less than 3 chickens. Whether you’re an existing poultry farmer or an amateur, getting the right chicken coop can be hard because the research can be time-consuming since the market has too many options. 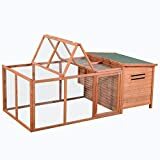 Lucky for you, we have selected the top ten best chicken coops to guide and help you make a quick yet well-informed decision on which to buy.